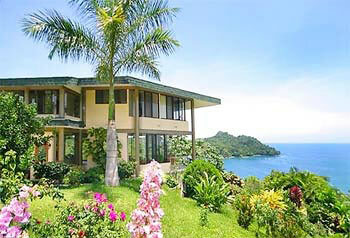 Quepos and Manuel Antonio are two separate but completely interdependent central Pacific coast towns. Quepos is a fairly good sized town with about 7,000 permanent residents, a large hospital, banks, markets, stores, hotels, bars, restaurants and main bus terminal. Manuel Antonio to the south is much smaller and extends along both sides of the road that stretches 4 1/2 miles up the hill and them down to the Manuel Antonio National Park. Even though there are hotels and restaurants of many nationalities on this hill between Quepos and the park. It is still common to walk along the lush green, tree lined road and see two toed sloths, bright green parrots and large iguanas. In the hills overlooking the ocean are some of the most picturesque and stunning views in the country along with accommodations from luxurious to basic. Manuel Antonio National Park is the country’s smallest national park at just over 683 hectares, but it is also one of it’s most amazing. Home to one of the last sizable populations of the endangered Squirrel Monkey in the region, White Faced and Howler monkeys are also common in the park. 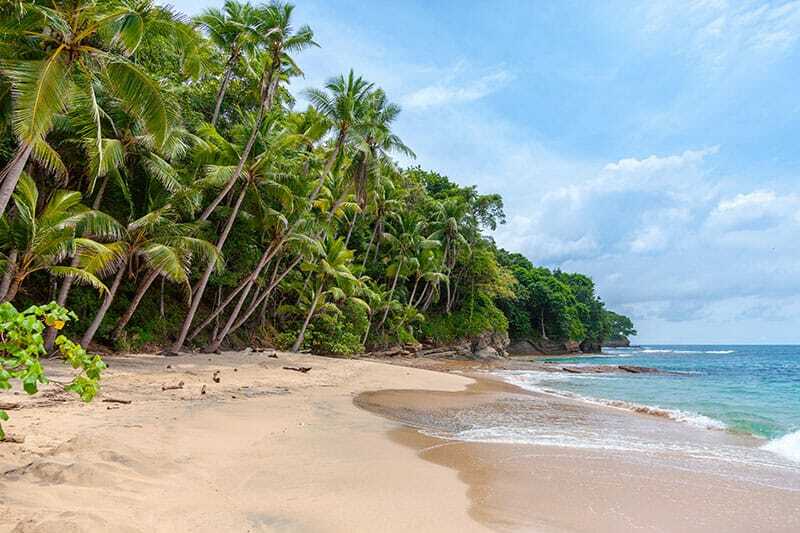 Cathedral Point with it’s forest topped cliffs is connected to the mainland by a thin land bridge that separates the parks two most popular beaches, Playa Espadilla Sur and Playa Manuel Antonio. Playa Manuel Antonio is one of the most beautiful beaches in Costa Rica and has been rated one of the top ten in the world. The beach is a half mile long, perfect white sand crescent bordered by deep green mangroves and palms. The park abounds with wildlife and in a days visit it is possible to see iguanas, monkeys, sloths agoutis, paccaries armadillos, pisotes, coatimundis and raccoons. You can travel to Quepos by car or on regularly scheduled flights. Sansa has three flights a day during high season. The flight from San Jose takes about 20 minutes. It is a beautiful three and a half hour drive by car from San Jose. While a 4×4 vehicle is not required, I recommend one because some sections of the road have serious potholes and the clearance and durability of 4X4s is an asset. Manuel Antonio is a little slice of paradise that I highly recommend if you are looking to for a beautiful beach, sportfishing or if you are just nature lovers. All are up on the hill between Quepos and Manuel Antonio National Park, where you can enjoy great views and cooling breezes. If you don’t have a car, there are taxis and there is a bus that runs every 30 minutes from the beaches and national park at one end to the town of Quepos at the other. Costa Verde – The catch phrase of this Costa Verde Hotel is “still more monkeys than people” and it amazingly holds true despite the increase in the amount of people visiting the area. At the hotel you will often see toucans, parrots, howler monkeys, white faced monkeys, squirrel monkeys, sloths, and numerous species of birds. This is part of the reason its been a favorite place to stay for travelers for some time now. The main talking point of the hotel is the 727 fuselage made from a 1965 Boeing Airplane and salvaged from the airport in San Jose. It was remodeled into a two bedroom suite and has been the talk of the town as well as travel magazines ever since. In addition, the hotel has a fantastic sea view and almost every room comes with a very nice large balcony. There are also three pools on the hotel property and one is adults only with a spectacular view of the Pacific and a pool bar. Now that is hard to beat! La Mariposa Hotel – I used La Mariposa Hotel more then a few times for our fishing clients and as and a place for the awards ceremony for the Costa Rica Classic fishing tournament that was held annually. This hotel has been discussed by Condé Nast Traveler as “Eden on a ridge” and is a three time winner of their “100 Best Hotels” award. Like the Costa Verde it has stood the test of time and has one of the best sunset views you will ever see with a infinity pool overlooking it too boot! The room are comfortable and almost all have a spectacular view from the balcony! If you are into birding than I would recommend getting an Ocean View Room and bringing some binoculars as there is good bird watching in the trees. You will also see your fair share of Monkeys, Macaws and Iguanas from this place as well and you are within easy walking distance of several good restaurants although you probably won’t for breakfast at least as they give one buffet style with some of the best fruit you will eat and the breakfast of champions and my personal favorite – “Gallo Pinto” and you get to eat this while looking at the pacific ocean. Si Como No Resort & Wildlife Refuge – How many hotels do you know are both a fantastic place to stay and also have its own wildlife refuge? The only place that I know like this is the Peace Lodge which I recommended in the San Jose Area Hotels post. The rooms at the resort are very comfortable and very clean and have views of either the jungle or the ocean. I’m not sure I would go so far as to say they are 5 star luxury but then again the resort doesn’t make this claim nor would I recommend staying here if you are looking to stay in the room for the majority of your time However, for the time you are there the views from the balcony are fantastic, food is amazing and the service top notch. At breakfast time, which is included with the price of your room, you can get eggs any way you want, fresh fruit and juices, “gallo pinto” (my favorite) and fresh bread. They throw the spectacular view in at no extra charge! Of course, what resort would be complete without a pool? The resort has a couple of pools one more for kids and the other more for adults so it works out well for those travelling with children. Each pool offers a swim up bar so make sure you watch the kids and putting it on “there tab”! The Si Como No also has what is calls it Greentique Wildlife Refuge that has a butterfly garden, reptile lagoon and guided night walks just to name a few. Its is also home to many different species of wildlife, ranging from macaws to white-faced monkeys and sloths. Oh and did I happen to mention has its own private theatre that offers movies every night? Tulemar Bungalows and Villas – This is a place I always recommend to people if service is their top priority. That is not to say that there aren’t many many more reasons to stay here but if there is one thing that stands out to me about Tulemar, and what is often the first thing people mention to me about there stay there, it is the service. There are plenty of rooms choices and far too many for me to go through here in this short article but rest assured that no matter which one you choose, they are all excellent, you just have to see which one fits your needs (and budget). And from whatever you pick you get great views, lots of wildlife sightings like Scarlett Macaws, toucans, falcons, sloths, howler monkeys, iguanas and more! ( you will feel you are living in a zoo), and boatloads of flora and fauna! Of course, you have the beautiful pools to sit around and relax by and the they have there own private beach so you all you need to do at either is put yourself under a shade tree and relax! Tulemar also has great activities for both adults and kids for example, for example, they have what they call a sloth walk that is done by the Sloth institute of Costa Rica ( yes, there is such a thing) and is just for those staying at the hotel. There is also paddle boarding, a night jungle tour and a bunch of day tours that you can choose from but most of those are outsourced to local companies.